Although this product seems to make my skin appear a bit smoother I notice it breaking me out a lot. Not sure if it's the fragrance or the mineral oil. Never really thought my skin was sensitive but if it wasn't for it making me break out I would review it differently. I just put two small drops in my hand and rub together before applying to my face and neck. 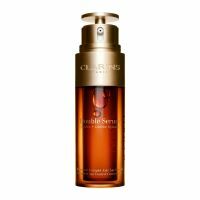 It is not too oily for me under my Clarins Everlast foundation. It smells wonderful too! This was expensive and I am almost finished with the bottle. I saw absolutely no results and can't wait to throw the empty bottle away. It says use twice a day, but I only use it at night because it would be too sticky to use under makeup.